Use our 4" connectors to quick connect your EL Wire to inverters. This is the connector that we use on EL Wire. Make super splitters with many wire connection possibilities. Create your own wiring harnesses. The possibilities are endless. 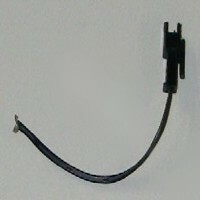 Use female connectors on the inverter side and male connectors on the EL Wire side. This is the way we and other EL Wire suppliers do their connections. This way your components will always interchange.